Regarded as ideal for small projects, the DEWALT DWP611 wood router has a 1.25 HP motor that delivers high power and torque. It is fitted with a soft start feature and a variable speed control that goes from 1 to 6. Furthermore, it delivers 16,000 to 27,000 RPM. This design comes in both plunge and fixed base and has ¼ inch collet ideal for beginners. The Additional feature such as the LED lights on the bottom illuminates your project, and thus makes your cutting easier. DEWALT DWP611 is an innovative wood router that has a combination of features that make it desirable. This router has the capacity to handle an extensive range of applications including flush trimming, minimal bevel cuts and huge edge profiles among others. What makes DEWALT DWP611 high quality? Powerful and Efficient Motor: Has a 1.25 Horsepower Dewalt motor that can handle even the toughest tasks that compact routers handle. It has an operating input voltage of 110/120 Volt and can only use 7 Amps of power making it very efficient in operation. Soft-Start and Full-Time Electronic Feedback feature: Which eliminate cracking and chipping that are common with other compact routers. It also helps eliminate sudden power surges or spikes during start up. This is ideal for attaining consistent performance in the piece of work. Variable Speed: Comes with a variable speed controller that enables the user to select the correct router speed for the task at hand. Its speed range from 16,000 to 27,000 RPM. With these speed options, you can do a variety of tasks quite easily. Depth Adjustment Ring: Comes with this feature that facilitates accurate and precise depth adjustments. The user can make it changes up to 1/64 inches which so precise and accurate for outstanding results when cutting. Dual LEDS and Clear Sub-Base: For maximum visibility of the work piece. You have more control on your project. What makes the product easy to use? With the depth adjustment ring you are able to adjust the depth and get precise and accurate depths. Has a lowly-placed grip and is situated close to the work surface. This is ideal for precision. Has a clear sub-base and dual base LEDs that guarantee maximum visibility when routing. You can take full control of the operation. Its D-shaped base plate is quite large hence it is more stable. 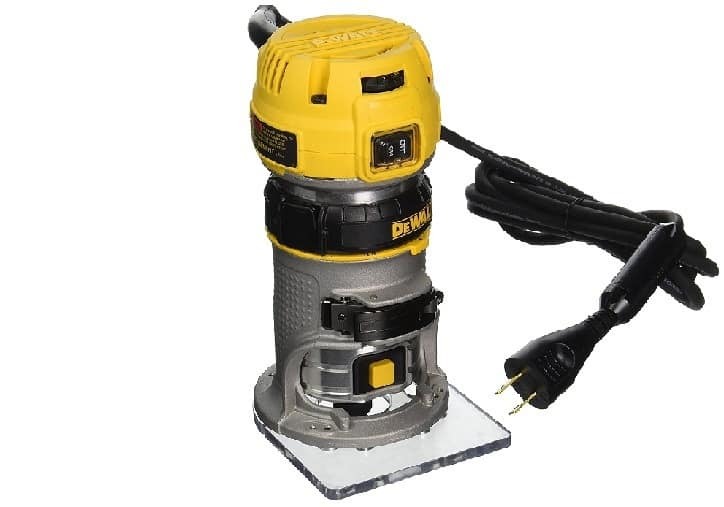 Has a spindle lock that makes router bit changing easy and fast. It has an aluminium housing which protects the entire system and makes it durable. There are several shaft-lock detents, which make the process of changing bits to be easy and manageable. The base can be removed easily as a result of the spring-loaded release locks. Safety locking mechanism in the depth ring and the clamp system. It is well built and sturdy in design. Easy to adjust for perfect depth control. LEDs are good for maximum visibility, especially in lower-light scenarios. It is lightweight hence perfect for tasks that require the tool to be carried around. It is easy to clean, unlike other router kits. Lacks a case or storage compartment for the router components. You cannot change the bits without removing the motor. It only has a ¼ inch collet, which limits the use of other shank bits. Not comfortable enough to use for long when compared to other routers. It lacks rubber layer on its grip. It mainly has a fixed base, which means that you would have to pay more for the plunge base. This router usually has a fixed base, which means that your applications will be guided by this fact. You can buy the plunge base separately and attach it to the router when the need arises. Use the clear sub base and the LED lights to gain full visibility of the surface being worked on. The base is shaped as the letter D, which gives you close proximity to the surface. There is a manual that will provide basic maintenance and repair information. You can always refer to it when changing bits or cleaning the various components. All the accessories should be stored in their respective cases. In the event that the router completely malfunctions, you should contact the manufacturer so as to establish if your warranty covers the type of damage. DEWALT DWP611 is an ideal tool for crafters at all levels from novices to experts in wood work. The numerous features and unique design of this router give the other models a run for their money. You should, however, be clear on your woodwork needs before buying this router as it may have some limitations.